As of 8:27am ET, SPY is trading just below this 214.05 R level (circles show the numerous reaction reactions) & therefore, is indicated to gap up into or around resistance. 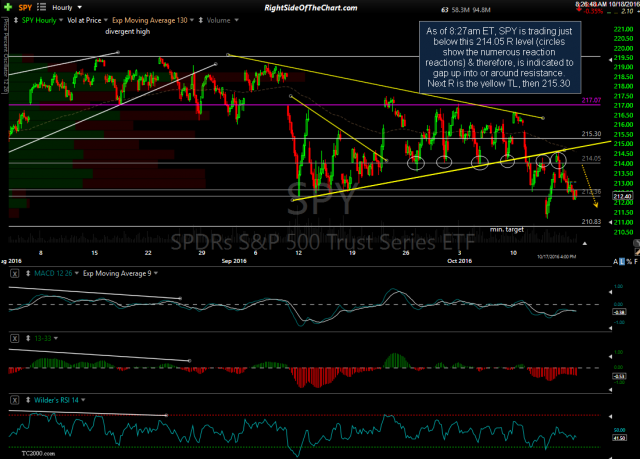 Next R is the yellow TL, then 215.30. 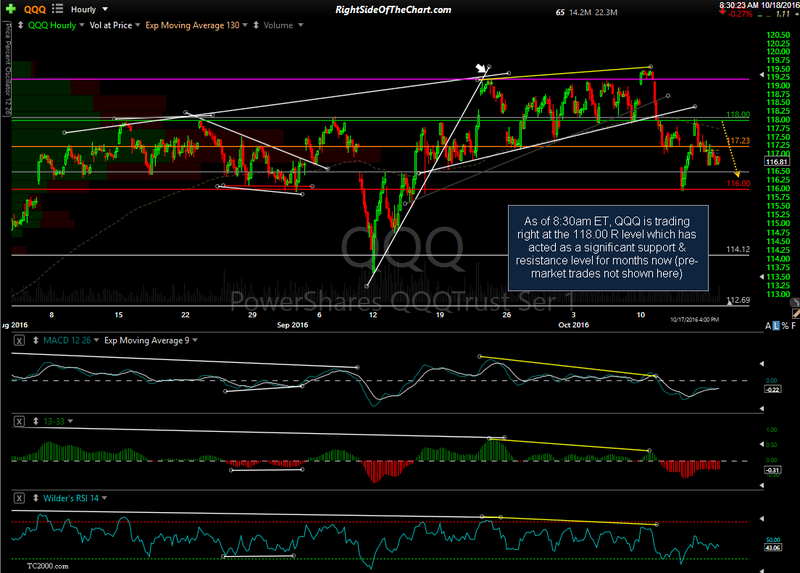 QQQ is trading right at the 118.00 R level which has acted as a significant support & resistance level for months now (pre-market trades not shown on these 60-minute charts). Bottom line: The US equity markets still remain well within the sideways trading ranges which have contained prices for over 3 months now while a downside resolution of these ranges still appears the most likely scenario, we need to see those ‘flashpoint’ support levels taken out (or a convincing break above the pattern) before the next clear bullish or bear trend gets underway. A couple of points to add to this post. The trend indicators on both the 60-minute & daily time frame (two separate trend indicators on each) are currently bearish on the SPY while on QQQ, my 60-minute trend indicators are bearish with the daily trend indicators still bullish (both since early July). So far, both SPY & QQQ have failed to hold above those resistance levels, giving back a portion of today’s gaps with the small caps (IWM, faded nearly 2/3rds of the gap so far). Today could be a pivotal day in the markets: If the bulls can clearly take out & close above those R levels mentioned in this post earlier today that would certainly be bullish near-term but until & unless they can close both the SPX & NDX back above those recently broken uptrend lines, the bearish case is alive & well. Should today’s gaps get 100% faded & then some, with the SPY & QQQ closing below yesterday’s close, I would view that as very bearish & expect those flashpoint support levels to break soon thereafter (within a few trading sessions).